THIS PHOTOGRAPH of my late father, Norman John Macleod, was taken in the 1950s. 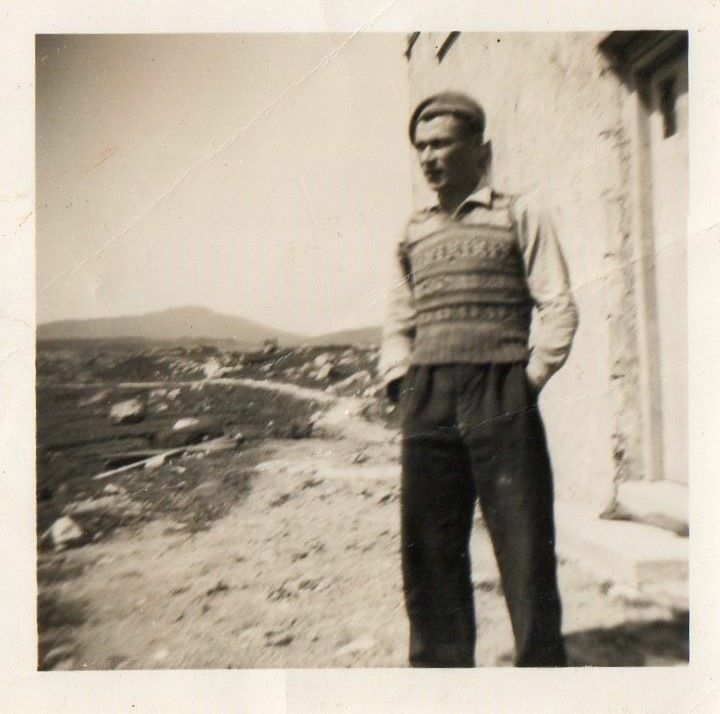 It shows him in Ardvie, the village in the Bays of Harris where he was born in 1926. His parents were unmarried, a complicating factor in a Free Presbyterian childhood that led to him being brought up by his Aunt Kate on the croft of which she was the tenant and where he is pictured. Insofar as he belonged to anyone, my father belonged to her; a proxy filial bond cemented to the extent that everyone in the village knew him as ‘Tormod Ceit’ (Kate’s Norman). Behind him stands a tangible symbol of their shared existence; the croft house he built with help from a neighbouring tradesman and stone hauled from the seemingly endless supply in the quarry under Roineabhal’s shadow less than a mile away.